Sit back and relax as you sail along the picturesque Santa Cruz coastline. Once aboard, you can enjoy the sights of the Monterey Bay wildlife and Santa Cruz’s must-see landmarks from the best view in town, all while experiencing the fun of sailing on a smooth, stable catamaran. 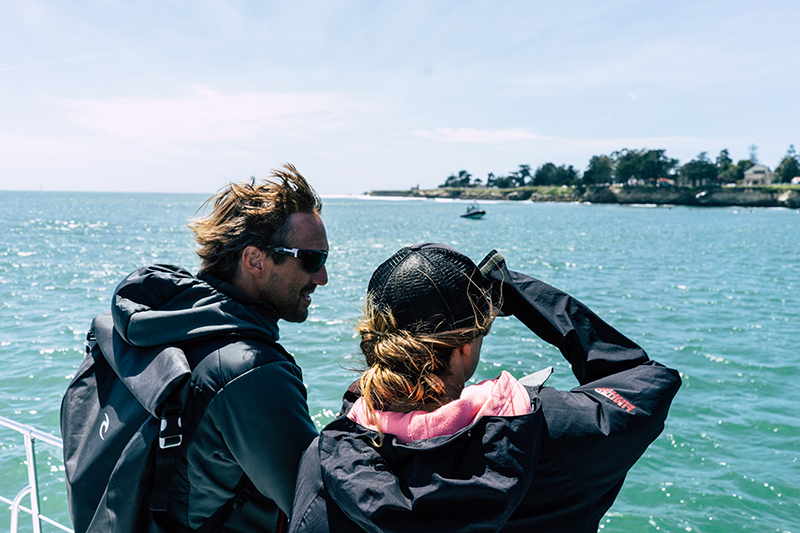 Keep your eyes open for sea lions hanging on the pillars of the Santa Cruz Wharf or off the Mile Bouy, otters relaxing in the kelp forests, and dolphins or whale tails that just may spring up out of the water at any point during your sail. On clear days, you can see across all 26 miles of the Monterey Bay to the city of Monterey, and take in all the beauty this Marine Sanctuary has to offer. On this short and sweet sail, our typical sail route includes sailing past the iconic Santa Cruz Beach Boardwalk, Santa Cruz Wharf, Cowell’s Beach in front of the historic Dream Inn, and along the coastline of West Cliff Drive towards world-class surfing spot Steamer Lane located below the Santa Cruz Lighthouse & Surfing Museum. We’ll then cruise out further away from shore to pass the Mile Buoy, and continue to sail out on the bay before returning to the harbor, where we will pass the Walton Lighthouse for a second time before docking. On this extended sail, our typical sail route includes everything we see on our 1-Hour Daytime sail, but we’ll also get to venture further onto and see more of the Monterey Bay. We’ll sail south along the kelp forests near Pleasure Point, past local-favorite surfing spots The Point and The Hook below East Cliff Drive, off-shore of the Capitola Wharf and colorful Capitola Village, and near New Brighton State Beach. On our way back, we’ll sail by Sunny Cove Beach and Twin Lakes State Beach, before returning to the dock. All sail routes are subject to change based on current wind, swell and overall weather conditions.